The Book of Deuteronomy (from Ancient Greek: Δευτερονόμιον, Deuteronómion, "second law"; Hebrew: דְּבָרִים‎, Devārīm, "[spoken] words") is the fifth book of the Torah (a section of the Hebrew Bible) and the Christian Old Testament. The Hebrew title is taken from the opening phrase Eleh ha-devarim, "These are the words..."; the English title is from a Greek mistranslation of the Hebrew phrase mishneh haTorah hazoth, "a copy of this law", in Deuteronomy 17:18, as to deuteronomion touto – "this second law". 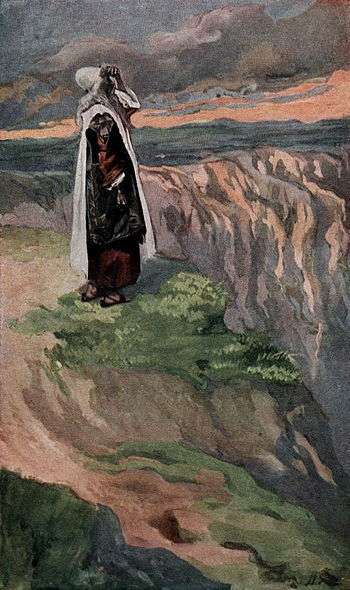 The book consists of three sermons or speeches delivered to the Israelites by Moses on the plains of Moab, shortly before they enter the Promised Land. The first sermon recapitulates the forty years of wilderness wanderings which have led to this moment, and ends with an exhortation to observe the law (or teachings), later referred to as the Law of Moses; the second reminds the Israelites of the need for monotheism and observance of the laws (or teachings) he has given them, on which their possession of the land depends; and the third offers the comfort that even should Israel prove unfaithful and so lose the land, with repentance all can be restored. 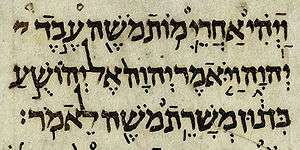 Traditionally seen as the words of Moses delivered before the conquest of Canaan, modern scholarship sees its origins in traditions from Israel (the northern kingdom) brought south to the Kingdom of Judah in the wake of the Assyrian conquest of Aram (8th century BC) and then adapted to a program of nationalist reform in the time of Josiah (late 7th century BC), with the final form of the modern book emerging in the milieu of the return from the Babylonian captivity during the late 6th century BC. Many scholars see the book as reflecting the economic needs and social status of the Levite caste, who are believed to have provided its authors. In the late 8th century both Judah and Israel were vassals of Assyria. Israel rebelled, and was destroyed c.722 BC. Refugees fleeing to Judah brought with them a number of new traditions (new to Judah, at least). One of these was that the god Yahweh, already known and worshiped in Judah, was not merely the most important of the gods, but the only god who should be served. This outlook influenced the Judahite landowning elite, who became extremely powerful in court circles after they placed the eight-year-old Josiah on the throne following the murder of his father, Amon of Judah. By the eighteenth year of Josiah's reign, Assyrian power was in rapid decline, and a pro-independence movement gathered strength in the court. This movement expressed itself in a state theology of loyalty to Yahweh as the sole god of Israel. With Josiah's support they launched a full-scale reform of worship based on an early form of Deuteronomy 5–26, which takes the form of a covenant (i.e., treaty) between Judah and Yahweh to replace that between Judah and Assyria. This covenant was formulated as an address by Moses to the Israelites (Deut.5:1). The next stage took place during the Babylonian captivity. The destruction of the Kingdom of Judah by Babylon in 586 BC and the end of kingship was the occasion of much reflection and theological speculation among the Deuteronomistic elite, now in exile in the city of Babylon. They explained the disaster as Yahweh's punishment of their failure to follow the law, and created a history of Israel (the books of Joshua through Kings) to illustrate this. Dillard and Longman note that the centralization of worship is an important and repeated theme in Deuteronomy, and that this is designed to focus the hearer's attention on the unique and exclusive holiness of Yahweh. After the review of Israel's history in chapters 1 to 4, there is a restatement of the Ten Commandments in chapter 5. This arrangement of material highlights God's sovereign relationship with Israel prior to the giving of establishment of the Law. The Ten Commandments in turn then provides the foundational principles for the subsequent, more detailed laws. Some scholars go so far as to see a correlation between each of the laws and each of the more detailed 'case-law' of the rest of the book. This foundational aspect of the Ten Commandments is also demonstrated by the emphasis to actively remember the law of God (Deuteronomy 6:4–9), immediately after the Ten Commandments. The Law as it is broadly presented across Deuteronomy defines Israel both as a community and defines their relationship with Yahweh. There is throughout the law a sense of justice. For example, the demand for multiple witness (Deuteronomy 17:6–7), cities of refuge (19:1–10), or the provision of judges (17:8–13). The covenant is based on seventh-century Assyrian suzerain-vassal treaties by which the Great King (the Assyrian suzerain) regulated relationships with lesser rulers; Deuteronomy is thus making the claim that Yahweh, not the Assyrian monarch, is the Great King to whom Israel owes loyalty. The terms of the treaty are that Israel holds the land from Yahweh, but Israel's tenancy of the land is conditional on keeping the covenant, which in turn necessitates tempered rule by state and village leaders who keep the covenant: "These beliefs", says Norman Gottwald, "dubbed biblical Yahwism, are widely recognized in biblical scholarship as enshrined in Deuteronomy and the Deuteronomistic History (Joshua through Kings)." Deuteronomy 6:4–5: "Hear, O Israel (shema Yisra'el), the LORD is our God, the LORD is one!" has become the basic credo of Judaism, the Shema Yisrael, and its twice-daily recitation is a mitzvah (religious commandment). It continues, "Thou shalt love the LORD thy God with all thy heart and all thy soul and all thy might"; it has therefore also become identified with the central Jewish concept of the love of God, and the rewards that come with this. ↑ Dillard & Longman, p.102. ↑ Dillard & Longman, p.104. Avigdor Miller (2001). Fortunate Nation:Comments and notes on DVARIM. Ausloos, Hans, The Deuteronomist’s History. The Role of the Deuteronomist in Historical-Critical Research into Genesis–Numbers (Old Testament Studies, 67), Leiden – Boston: Brill, 2015. Block, Daniel I (2005). "Deuteronomy". In Kevin J. Vanhoozer. Dictionary for Theological Interpretation of the Bible. Baker Academic. Bultman, Christoph (2001). "Deuteronomy". In John Barton; John Muddiman. Oxford Bible Commentary. Oxford University Press. ISBN 9780198755005. Christensen, Duane L (1991). "Deuteronomy". In Watson E. Mills; Roger Aubrey Bullard. Mercer Dictionary of the Bible. Mercer University Press. ISBN 9780865543737. Dillard, Raymond B.; Longman, Tremper (January 1994). 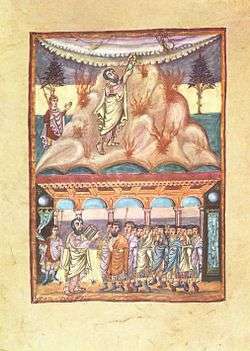 An Introduction to the Old Testament (PDF, 3.5 MB). Grand Rapids, MI: Zondervan. ISBN 978-0-310-43250-0. LCCN 2006005249. OCLC 31046001. Retrieved 2012-02-24. Knight, Douglas A (1995). "Deuteronomy and the Deuteronomists". In James Luther Mays; David L. Petersen; Kent Harold Richards. Old Testament Interpretation. T&T Clark. ISBN 9780567292896. Laffey, Alice L (2007). "Deuteronomistic theology". In Orlando O. Espín; James B. Nickoloff. An introductory dictionary of theology and religious studies. Liturgical Press. ISBN 9780814658567. Markl, Dominik (2013). "Moses' Praise and Blame – Israel's Honour and Shame: Rhetorical Devices in the Ethical Foundations of Deuteronomy". Verbum et Ecclesia. 34. McConville, J.G (2002). "Deuteronomy". In T. Desmond Alexander; David W. Baker. Dictionary of the Old Testament: The Pentateuch (PDF). Eisenbrauns. McKenzie, Steven L (1995). "Postscript". In Linda S. Schearing; Steven L McKenzie. Those elusive Deuteronomists: the phenomenon of Pan-Deuteronomism. T&T Clark. ISBN 9780567563361. Rogerson, John W (2003). "Deuteronomy". In James D. G. Dunn; John William Rogerson. Eerdmans Commentary on the Bible. Eerdmans. ISBN 9780802837110. Romer, Thomas (2000). "Deuteronomy In Search of Origins". In Gary N. Knoppers; J. Gordon McConville. Reconsidering Israel and Judah: recent studies on the Deuteronomistic history. Eisenbrauns. ISBN 9781575060378. Romer, Thomas (1994). "The Book of Deuteronomy". In Steven L. McKenzie; Matt Patrick Graham. The history of Israel's traditions: the heritage of Martin Noth. Sheffield Academic Press. ISBN 9780567230355. Tigay, Jeffrey (1996). "The Significance of the End of Deuteronomy". In Michael V. Fox; et al. Texts, temples, and traditions: a tribute to Menahem Haran. Eisenbrauns. ISBN 9781575060033. Van Seters, John (1998). "The Pentateuch". In Steven L. McKenzie; Matt Patrick Graham. The Hebrew Bible today: an introduction to critical issues. Westminster John Knox Press. ISBN 9780664256524. Paterson, James Alexander (1911). "Deuteronomy". Encyclopædia Britannica (11th ed.). Jastrow, Morris (1905). "Deuteronomy". New International Encyclopedia.